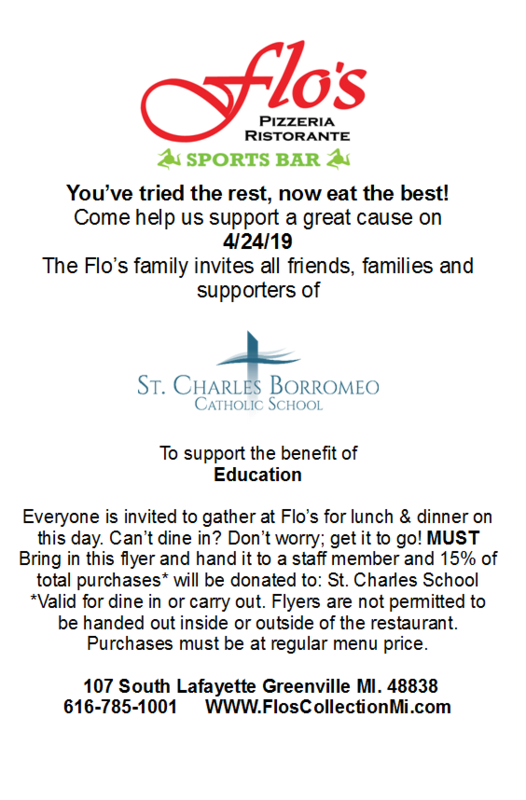 Join us on Wednesday, April 24th at Flo’s in Greenville for the monthly fundraiser in support of St. Charles School. Stop in for lunch or dinner, dine-in or take-out. Present a printed copy of the fundraiser flyer with each bill and 15% will go to support St. Charles School. Copies of the flyer can be picked up in the St. Charles School or Parish office. Registration for Steubenville 2019 has Begun! At the core of our being is a desire for meaningful connection and authentic relationship. We long to love and be loved, but how often do we just feel lonely? This summer, over 50,000 Catholic teens across North America will attend one of 24 Steubenville Youth Conferences to encounter the God who calls us His sons and daughters. Come and experience His overwhelming love for you. You belong here. Teens from St. Charles and St. Joseph-St. Mary will attend the Steubenville Youth Conference from July 12-14, 2019. 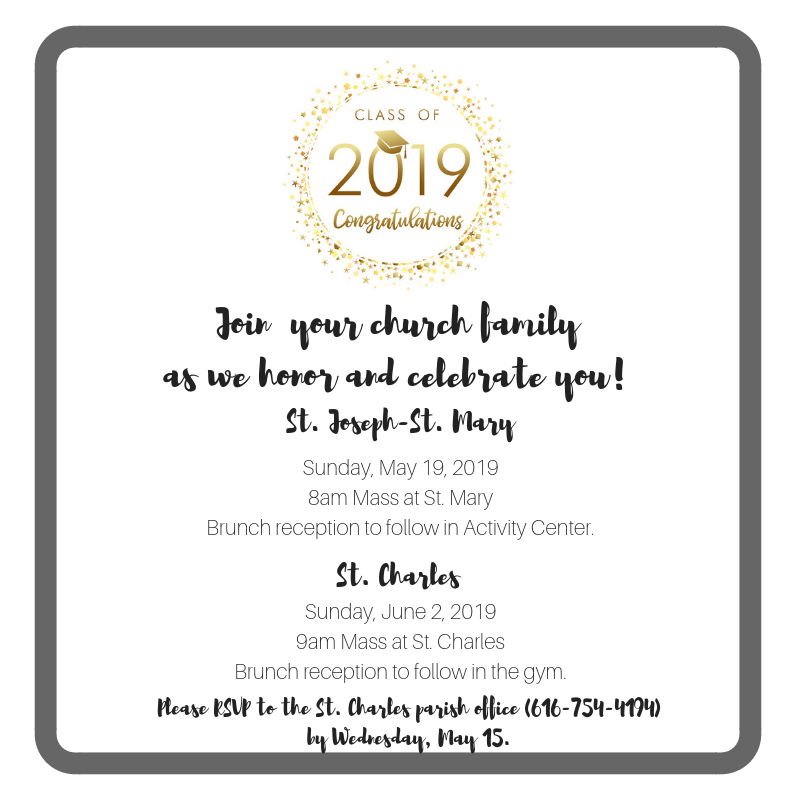 Registration is open to YM3 & parishioner families through April 15th. After that, any open spots still available will be offered to other teens from the community who would like to attend. Cost for the conference is $150.00. $75.00 is required to reserve your teens spot. The remaining $75.00 is due before the conference. 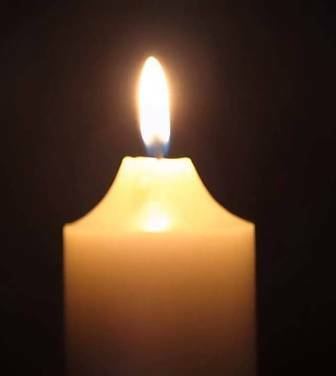 Parents are asked to fill out the online Steubenville Expectations form, the online Steubenville Registration and Waiver form, and the Steubenville Liability form (the link to this form can be found at the bottom of the Registration and Waiver form). Contact Natalie Klackle with any questions at nklackle@saintscjm.com. Dómini – of the Lord. 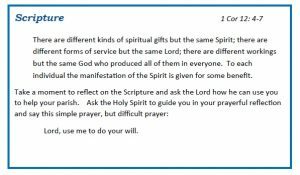 Mysterium fidei! Literally: Mysterium = the mystery; fidei = of faith. We proclaim Your death, O Lord. 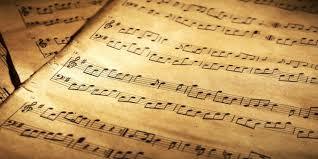 miserere nobis. have mercy on us. 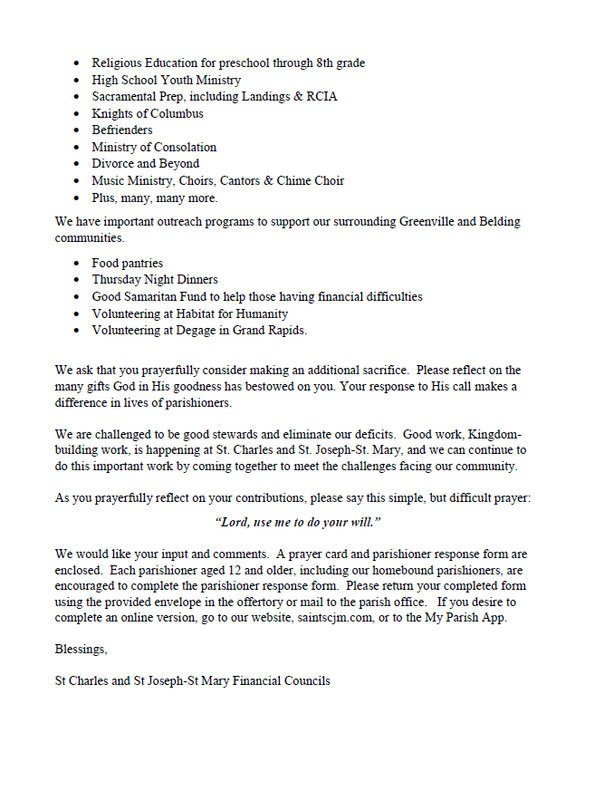 In a continuing effort to be as transparent as possible, Bishop Walkowiak has taken time to create a video message for the faithful of the Diocese of Grand Rapids ahead of the worldwide meeting of bishops at the Vatican. 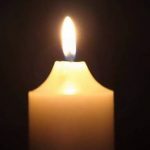 The worldwide meeting, which will gather presidents of bishops’ conferences from around the world to discuss the clergy sexual abuse scandal and our global response as a Catholic Church will take place from Feb. 21 – 24. 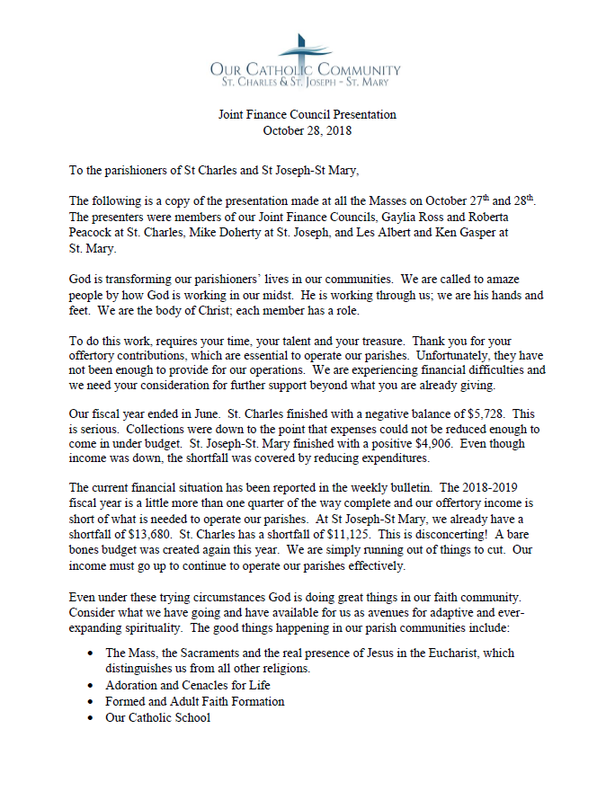 The video addresses the meeting and some of the frequently asked questions he has received from parishioners. More and more people are realizing that the world doesn’t have all the answers. Younger people are looking for truth and substance. 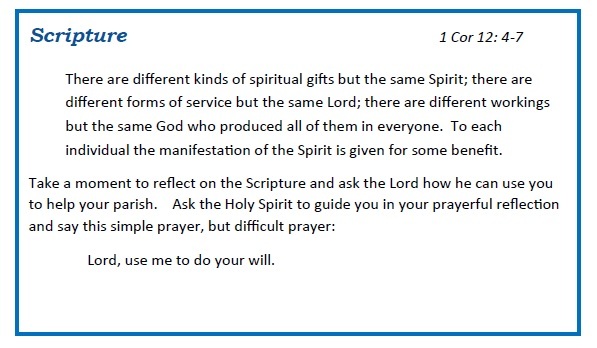 We have the richness of our Catholic faith to share will all people who are searching. 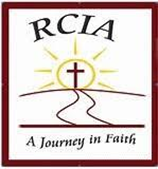 RCIA – Rites of Christian Initiation of Adults is a process that does not require any commitment to come and search for truth and ask questions. We have several new people beginning their journey and others who are continuing their journey. For more information contact Molly Scoby at 754-4194 ext. 131 or dre@saintscjm.com . We will begin weekly sessions using Symbolon: Knowing the Faith which is presented by trusted and compelling teachers and filmed around the world with stunning cinematography. Symbolon:Knowing the Faith explains the essentials of the Catholic Faith in a way that will inform our minds and inspire our hearts. We meet every Monday at 6:30 p.m. at St. Charles in McKinney Hall.